1. Place the stock in a pan over moderate flame. 2. Add the onions and potatoes. 3. Bring to a boil till the onions and potatoes are soft. 4. Puree them in a blender. 5. Mix the egg yolk with milk. 6. Transfer the puree into a pan and place over low-medium flame. 7. Warm it gently and gently add the milk-egg mixture and butter. 9. Add the prawns and cook till they curl up. 10. If the soup is too thick, add water or stock. 11. Garish with coriander leaves. 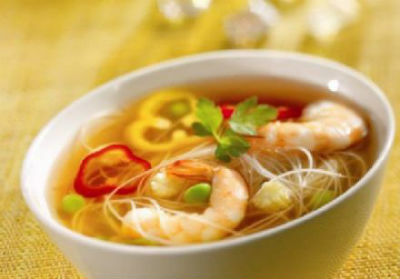 Feel free to comment or share your thoughts on this Prawn Soup with Potatoes Recipe from Awesome Cuisine.